I wanted to take a moment to reach out to all of you today to wish you just the merriest, and the most wonderful of Christmases. Of course, I also understand many people of various faiths read Jacobs ladder, and so I wanted to also wish all of you the very best holiday. I don’t distinguish one religions holiday over other. For they should all be joyous times. And they are all reminders of the place of peace, and praise, that we all can enter into on a regular basis. That is the Kingdom of God after all. It is Righteousness, Peace, Joy, and Powerful love. And this is why I wanted to take a moment to personally bless all of you and speak my heart to all of you for this Holiday Season. I sure hope the words of this short video touch your heart, and the following short insights into the Finger Of God and the Kingdom set you free from all the lies you have believed! Kingdom of God/Casting Out Devils – explained simply. If you have known me for awhile you know the Kingdom of God and Heaven is not a literal place but a state of mind/being. The Kingdom (reign or rule) of God is not a place of carnal pleasures, but righteousness (proper judgment/sound thought) peace, joy and power. Now how does one find the Kingdom of God? One must be enlightened to the truth, and set free from lies they have believed. The TRUTH sets us free… From lies… Obviously. And what is the FINGER of God, that casts out devils/lies and reveals the Kingdom of God in your life? The Commands/promises of God were written with God’s FINGER (instruction), Jesus healed the deaf by putting his FINGER in their ear so they could (hear the truth). A Finger points you in the right direction. Even the carnal use the Finger to teach. The FINGER of God points you to the TRUTH, it is instruction, teaching, etc. How else would you cast out a lie, but by teaching the truth? In other words, until the truth is taught (finger of God)… you are usually possessed by lies. But if those lies/demons are cast out with the “finger of god”=teaching of truth then the “Kingdom” has come upon you. Until that day people still play games like children who believe lies about literal places in the sky. And how does one know who has the Kingdom of God, or who has the truth? If they teach you and it brings peace, proper judgment, and joy into your life … That’s how! By their fruit they shall be known. Proper Judgment, Peace, Joy, and powerful love = The Kingdom of God. This is why it is revealed without literal observation. And can only be found within the heart of mankind. THE TRUMPET SOUNDS – FEAR NO MORE! This short powerful mini documentary will take your breath away! You have been lied to by this world your whole life, you have been fed a constant diet of fear, worry, shame, greed, and pride. Because of this cruel brainwashing you took upon yourself the sins/lies of the world and WHO YOU TRULY ARE IN ESSENCE DIED… but that is about to change! You are more than you know! This short mini movie will open your eyes to a great enemy hiding in plain sight. “Roaming to and fro seeking whom it may devour”. This “enemy” disguises itself as “god” and most worship this liar as god. For your enemy is most certainly the god of this carnal ignorant world. Yet, this enemy is not your god anymore… because now the truth you have begun to see clear. This enemy, your adversary, the devil is also called the carnal ego/id of mankind. This is the JUDAS that dines with you, sits at the table with you, and betrays you for THE LOVE OF MONEY AND POWER. This “enemy” is the root of your fear and it has stolen your life away with it. HOWEVER, THAT IS ALL ABOUT TO CHANGE! It’s time to wake up to the new day we are in and LIVE our life! The TRUTH sets you free from the lies you believe about yourself and others. When the DAYSTAR rises in your heart you will know which voice to listen to, which words to bring forth, which thoughts to manifest and which thoughts to cast away and you will FEAR NO MORE. There are two voices in everyone’s head. The quieter voice is always the better choice, because the louder offers only fear and dread. The quieter voice is love and truth, the louder voice will lie to you and make you wish you were dead. This is why you must find the quieter voice today. The louder voice will shout and pout and will do everything to make you believe these thoughts are actually coming from you. The Louder voice will demand action, demand revenge, and will always make you do what you should not do. The quieter is your hope, salvation, and great reward, this you will find. The louder will grind hope and peace to powder if you allow it each and every time. This is why the still quiet voice you must find. You can choose to win or lose, whether to fall or rise. The loudest is the room is always wrong, while the one who thinks before he acts and speaks is wise. So take your thoughts captive and see whether they be true or lies. In the end, my friend, you will thank me, because the quiet voice is peace, power, purpose and perfection finally realized. This plans to be a very short and eye-opening essay on a simple scripture that seemed to open itself up to me within seconds of me hearing it. Tonight I had just come back from a business trip and yes it was on Easter. All morning I had been troubled because I really wanted to write something. There were so many taking to social media and making such passionate and bold statements about what they believe. I was hard to ignore all of the posts where people wrote, “He has risen” and so on and so on. I also hungered to share something, but I see the resurrection of Christ very differently. I have written extensively about this so I don’t want to weigh this paper down with more of what I have already shared. However, I will state that there was a time when I would have also written something similar. Of course, there was a time I believed all sorts of things that I not KNOW were never true to begin with. Even so, these false beliefs were stepping-stones for me. With each step put before me I would take it. Soon I would find another step to take, and then another until I had finally matured and reached the pinnacle where I could finally understand what these things truly meant to begin with. I have written often about the allegory of scripture. How we are told in black and white that God opens his mouth in parable. We are told how the Glory of God (the existing one or one who exists) is to conceal a thing. Which means, the glory of the one who truly exists is revealed when that which has been hidden is uncovered…. The scriptures are very clear that the things of the “kingdom of God” are not easily understood… that they are in fact a mystery. A hidden truth. After all it is the Glory of God to conceal a thing and the honor of Kings to SEEK after what has been hidden. 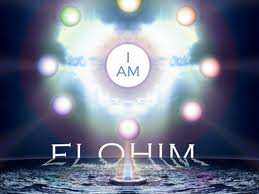 You see the mystery of the Kingdom of God has been HIDDEN within us all. So these stories we read about, whether they be literal events or not are NOT what we need concern ourselves with. It is the SPIRIT of the story that gives life… not the literal which keeps us all in darkness. And the SPIRIT of the story is the truth that bubbles into wisdom after you realize what something you have read and misunderstood in the scriptures finally means. This revelation or revealing of the truth does indeed give us LIFE… And this TREE of LIFE is the WISDOM of the TRUTH, which finally sets us free. (Wisdom) She is a tree of life to them that lay hold upon her: and happy is every one that retaineth her. So not everything that you believe or have been taught is necessarily true. Even if the whole world agreed that the Earth was flat their belief and agreement doesn’t make the statement true. I do understand that many people want to feel accepted, they want people to back up what they say or claim to know. No one wants to feel alone. But I will say that the path to truth, which is found by understanding the spirit of these stories can be a lonely one at first. The reason for this is we have all been conditioned from birth to embrace greed, lust, fear, hate, judgement, status, power, wealth, fame, and so on and so on… We are fed a constant diet of how we must behave. This is why we see so many suffering. This is why there is war and prejudice and hate and every ungodly thing. Now to rail against this, one must realize it is not an easy or celebrated road. Because once you begin to see the truth that sets you free from the egotistical fear that has ruled you for too long a sense of hope and peace comes over you. You begin to see the world through different eyes. You no longer want to repay anger with anger, you want to forgive, you have hope instead of fear, when you lose something you tell the world it is all part of a greater good. You become a light in a world of darkness and the darkness doesn’t like this light very much. Once the truth if revealed to you, you glow, you stand out, you influence others, and your new-found life (For this is the resurrected life that many should celebrate), your new-found life is more precious than anything in this world. You begin to do great and wonderful things for others and people will hate you for it. They will judge you, put words in your mouth, lie about you and try their best to extinguish that light that is burning them so bright. The devil/ego abode not in the truth, because there is no truth in him. When he speaketh a lie, he speaketh of his own: for he is a liar, and the father of it. Now this DEVIL (Ego of ours) can also come as an angel of light… We see this in almost every church service… Lies are passed off as godly truth. Yet, these lies perpetuate prejudice towards those who are different, judgement against those who don’t believe the way they are told to believe, fear in what could come, pride in the fact that you are somehow better than others… and so on and so on… Yet we know those who are of the LIGHT by how they love, and those who are yet in darkness by how they hate. When your eyes are opened you begin to see that ALL THAT IS IN THE WORLD is dangerous. And you realize that you may be IN THE WORLD but you are no longer a product of the WORLD…. Now we read this and believe that Jesus has said that HIS KINGDOM is in another dimension and if the nonsense the religious had done to Jesus had been done in HIS KINGDOM there would be hell to pay! Oh yeah.. we believed Jesus said, in my Kingdom if you dared do this to me, my servant would fight you and kill you dead! But that doesn’t really line up with Jesus’ message now does it? The word KINGDOM literally translates into “RULE, AUTHORITY… not of a literal Kingdom but the power and rule and authority a person is under when ruled by a King”… The word KINGDOM translates into WHAT RULES YOU! 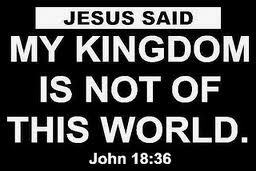 No the world… well according to scripture. All that is IN the world is the Lust of the Flesh, Eyes, and pride of Life. And who is the KING of this world… THE father of lies (your ego) himself. The KINGDOM of THE WORLD Jesus said he was NOT A PART OF would send servants to fight and kill on a leaders behalf… BUT NOT THIS IS NOT WHAT RULES THE AWAKENED ONES HEART! Revenge and murder and greed and power were NOT THINGS that motivated/ruled Jesus… BECAUSE he was ruled by something very different indeed… LOVE! So Jesus never said that in his Kingdom people would fight and kill and make war to set him free… NOOOOO! Jesus was saying the opposite… Please read the passage again WITH DIFFERENT EYES. Jesus answered… I am NOT ruled by the terrible things that motivate men trapped in darkness… I am NOT ruled by hate, greed, fear, or pride… which is why no one is coming to save me or fight for me… Because MY KINGDOM is NOT of this world… I am ruled by love, peace, forgiveness, mercy, compassion, patience and wisdom… So no, My Kingdom is NOT of this world… IF IT WAS then you would see people killing in my name, or on my behalf… Because that is the way those ruled by the lusts of the flesh, the lusts of the eyes, and the pride of life behave… My KINGDOM is not from such a place of darkness. This KINGDOM is WITHIN YOU! The RULE of GOD is to be RULED BY LOVE AND TRUTH! Which is why the more you see love and truth in all things, the easier it is to know the truth and love that was hiding there to begin with. We have been taught so many things the wrong way. It is time for us to seek the truth no matter what the cost. To never give up on a life that is truly worth living… Because whether you believe it or not YOUR KINGDOM IS NOT OF THIS WORLD as well… You may just not know it yet.